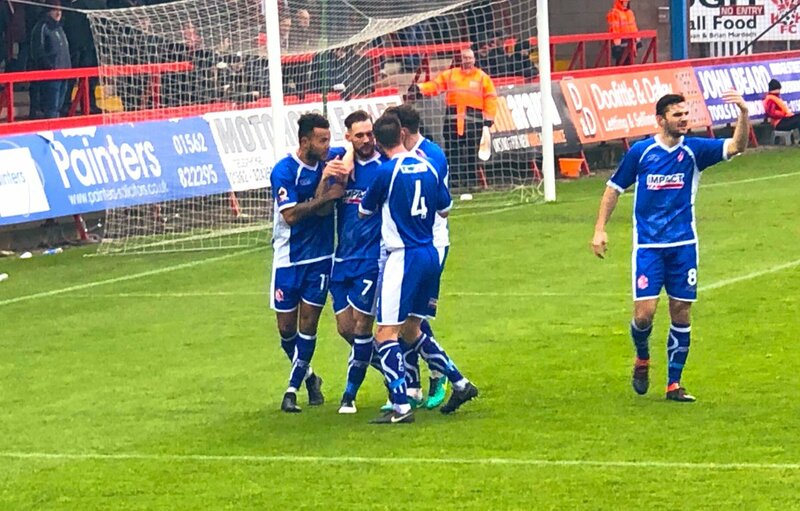 Reece Styche's first half close range header secured an impressive three points for the Reds at Aggborough, as we claimed a first win of 2019, against Kidderminster. Billy Heath made two changes from the Brackley defeat with Bobby Johnson and Josh Clackstone coming in to start, Tom Allan and Curtis Bateson moved to the bench. The hosts started brightly with Clayton-Phillips making a surging run into the box but his cross was cut out by captain Luke Shiels. Weeks took the corner but it was headed wide at the far post. Horsfall then produced a heavy pass in the box as Sam Ramsbottom claimed. Kidderminster were controlling the early play and were dominating the ball with Alfreton sitting back and staying organised with the ball firmly in front of them, there wasn't too many dangerous moments despite the control. The Reds started to create after eight minutes with Clackstone and Richard Peniket putting dangerous crosses in, the latter's cross couldn't find another blue shirt as it flashed across the face but we won a throw on the far side leading to Reece Styche firing over the bar. Peniket won a corner from a delightful lobbed pass from Tom Platt, which saw Bobby Johnson's corner cleared at the near post. McAlinden curled a free kick over the bar from 25 yards for the hosts before the same player picked a short corner up from Horsfall but the shot was straight at Ramsbottom through a crowded box. Peniket then was forced off the field after suffering from suspected ligament damage. It looked to be an awkward landing after challenging for an arial ball, the stretcher was called with Peniket leaving on it. After speaking to Assistant Manager Mark Carroll after the game, Peniket thankfully didn't have any breaks after being taken to a local hospital. Tom Allan replaced the striker and the game resumed as Martin Riley denied Clayton-Phillips searching run again. Alfreton were probing and were looking the side most likely to break the deadlock, Josh Wilde whipped a free kick in which was cleared before further balls in from Wilde and Johnson were cleared. After 26 minutes we took the lead, Johnson's corner from the left found it's way to the far post where Styche nodded in from a yard, injuring his eye in the process. It was deserved lead for Alfreton who had been threatening and creating the better openings despite the early pressure. Chambers blazed one over the bar before Styche took the ball down well and fed Clackstone on the right whose cross was again cut out before Allan was caught offside. Wilde flicked a long goal kick on from Ramsbottom which Allan chased and chased and magically won the ball on the far touchline before being bundled down in the process. Weaver touched Johnson's resulting free kick over the bar from a tight angle. The Reds saw the first half out well as tasty challenges started to fly in with Allan and Johnson both being caught, late defending from us saw Wilde touch a far post cross behind with the corner being cleared by Clackstone. The second half saw Harriers come into the game a little more but it was Alfreton who started the brighter with Kiddy clearing a Platt cross before clearing a brilliant Clackstone ball in. David Lynch fired over the bar from a corner before Sam was tested briefly by Butterfield from distance. Styche and Allan linked well with the big man forcing his way through in the box before Weaver raced out well to intercept. Bobby Johnson curled a free kick over the bar from 22 yards before a crucial interception denied Styche a clean run on goal from Allan's pass. Lynch brought down Clayton-Phillips on 68 minutes right outside the box as Harriers were looking to up the pressure, Weeks took it with the ball hitting an offside Joe Ironside as Sam made a point blank save. Kidderminster kept probing with Chambers glancing an effort wide from Weeks free kick. Before Weeks again had another free kick chance but fired the effort into the wall. Lynch reacted well to touch a dangerous move behind for a corner before we soaked up several more corners. Sam saved well with his legs to deny Chambers in the box from a tight angle. McAlinden then fired wide of the far corner in the box but it wasn't to be for the hosts who succumbed to defeat after a brilliant first half from Billy Heath's men. The second half saw us counter attack more frequently but defend solidly with the last ten minutes only really stretching us. A win to savour and a first one of 2019, we'll look to back it up with the visit of York City to the Impact Arena on Saturday, kick off is 3pm. ATFCXI: Ramsbottom, Clackstone, Wilde, Lynch, Shiels (c), Riley, Styche (Bateson 71), Platt, Peniket (Allan 21), Johnson, Smith.